We continue with our recap of the year 2018 with the No. 9 Story Of 2018. 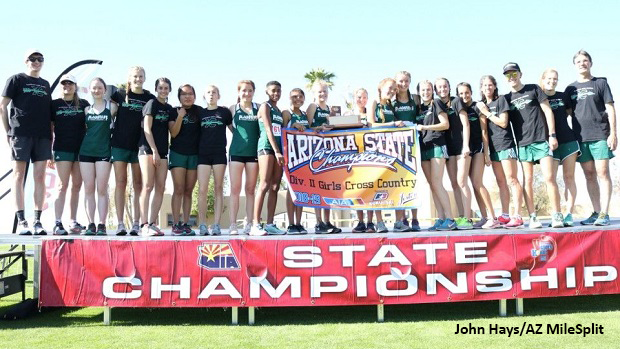 Have a look at Flagstaff's Sweep of the Division 2 State Titles at the AIA State Championships. The Division 2 races made up the second half of the morning races in between Division 4 at the AIA State Championships on Saturday morning. The Flagstaff Eagles had brought their A-Game with both the boys and girls teams eyeing a repeat State Title. From a team stand-point, Flagstaff know how to run in a crowd and things were no different on Saturday. In the D2 Boys' race, Max Davis (So.) and Riley Human (Jr.) led the charge with Nate Milton (Sr.) less than 20 seconds behind. Though, Casteel had briefly held the lead the Flagstaff Eagles rallied over the third mile and picked up 20 spots. Davis (10th) and Human (12th) finished just a second apart, while Milton came in at 16:50 to place 16th. Zac Joyce (Jr.) clocked in at 17:14 to finish 37th and Gabrial Harju (Jr.) picked up 13 places over the final mile alone, putting Flagstaff ahead of Casteel with 128 points to 144 points. Next came the D2 Girls race, in which Hana Hall had been favored to win the girls individual title as the faster of two girls under 18-minutes for 5km. That didn't stop Stefana Purkovic (North Canyon, Sr.) from leading the race for the Rattler girls. Over the first mile, Purkovic led Hall and Emily Stutesman (Deer Valley, Sr.) less than a second apart from one another. By the 2-mile mark Hall had overtaken Purkovic by a little over 5 seconds with Stutesman still in tow. Hall continued to open the gap and secured her first State Title in 18:07. It was also Flagstaff's first individual State Title since Courtney Lewis' (Class of 2016) victory just three years ago. Purkovic finished 2nd in 18:38 followed by Stutesman in 18:43 for their top career finishes. In the team race, North Canyon and Flagstaff traded places through the first two miles. North Canyon briefly held the lead over Flagstaff after the first mile and though the Rattlers maintained a closer spread through the 2-mile mark, the Eagles managed to position their girls to take over the lead by a single point. It was a tight last mile with both teams just pushing to hold onto as many key points as possible but in the end, Flagstaff held off North Canyon by just two points to clinch the Girls Team Title with a total score of 94 points. The Flagstaff Eagles had completed their sweep of the team title for the fourth consecutive year.